Good news: if you're after the cheapest AirPods prices, you're in the right place. Right now there may be a bit of a lack of online deals, sales, price cuts and other words for 'deals' on Apple AirPods gen 2. But there is ONE. But by the time you click on this it might be gone, in which case, apologies. Is it still working? You‘ll need to click the button marked “apply voucher” to seize that £10 saving. No, we have no idea why. You won’t see the discount until you check out - and you’ll need to be signed in to your Amazon account. Such obstacles. Numbers will be limited presumably so get the hell on with it, already. Right now, the best deal on the first generation of AirPods comes courtesy of BT. Who even knew BT had a headphones shop? They’re offering a big £10 off. Gee, thanks BT. If you want to make these seem more like the 2nd gen, you could always add a wireless charging case for £79. Nobody will ever know. • AirPods 2 isn't on sale anywhere other than Amazon but it is quite reasonably priced at £159 (or £199 for the wireless charging version). That's because this price is for the AirPods 2 or 2019 AirPods or whatever you want to call them. They have slightly better battery life than the first gen, the option of wireless charging and the ability to summon Siri with voice alone… and Apple is the only shop currently stocking them. Apple's default RRP for the AirPods 2 is £159/$159, so whatever you do, don't pay any more than that. If stock starts to run out, you'll possibly see some retailers charge more in the comparison chart above, but we'd urge you to hold on for normality to resume. A few retailers knocked £20/$20 off AirPods over the last Black Friday period, and now you should see more discounts until stocks run out – which we imagine could take a while. If the prices below are still a bit much, check out our picks for the Best Apple AirPods alternatives or maybe take a look at some other iPhone friendly options in our Beats headphone deals and Best Bose deals pages. Apple AirPods are a perfect match for the iPhone, and designed to sync instantly and allow easy control of Siri and Apple Music. However, at the end of the day, they're a pair of Bluetooth true wireless buds, and as such will pair with plenty of other phones and laptops. You could even pair them with an Android phone but note that they won't sync automatically as they would with an iPhone, you'll have to manually pair them, the old fashioned way. And obviously they won't give you access to Siri. Aww. 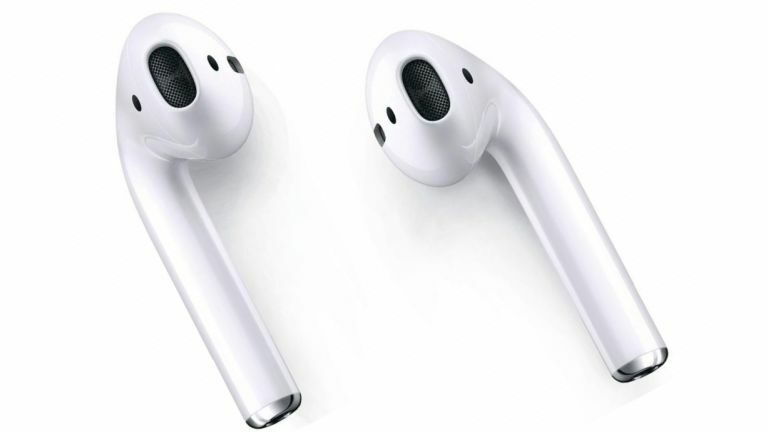 The Apple AirPods come with the carry case, which also acts as a charger, holding multiple charges for the headphones. In general you'll get 5 hours of use from a fully charged brace of AirPods, and the case has enough power in it to get you through a full 24 hours in total. The case is charged via a Lightning cable and doesn't need the AirPods inside to charge. • Apple AirPods 2 are here!